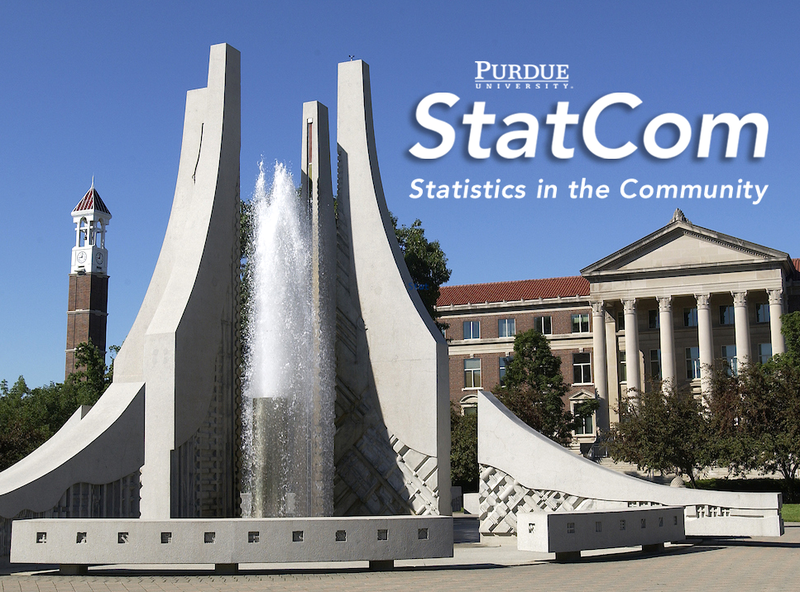 StatCom (Statistics in the Community) is an all-volunteer community service organization based in the Department of Statistics at Purdue University that provides professional consulting in statistics and data science to community groups, local governments and other non-profits. StatCom is managed by graduate students in Statistics and include students from diverse disciplines in its ranks, fostering a structured and collaborative environment to achieve statistical solutions to problems faced by entities that operate to pursue the greater good. StatCom was founded in an attempt to increase engagement between Purdue University and the surrounding community. Since 2001, StatCom has given students the opportunity to apply knowledge from the classroom to solve real-world problems. Some examples include modeling property prices for homes in Tippecanoe County, using demographic information to summarize and predict who leaves and who stays at a local homeless shelter, and working with the West Lafayette Public Library to see which items are checked out more often. Any non-profit or governmental group is encouraged to contact StatCom at Purdue about its particular needs or projects. Possible clients include libraries, schools, shelters, food banks, environmental organizations, or local government departments. In addition to the consulting services, StatCom at Purdue also started a P-12 Outreach component in 2004 which serves as an effort to increase interest and achievement in statistics among pre-college students. StatCom P-12 Outreach members at Purdue develop age-appropriate, hands-on statistics activities for educational events, such as classroom visits and community festivals. To contact StatCom at Purdue about a potential project or if you are student and want to get involved in StatCom, please email statcom@stat.purdue.edu and don't forget to follow us on Facebook: www.facebook.com/StatComPurdue.